Prominent & Leading Manufacturer from Noida, we offer pasta machine, pasta making line and pasta extruder machines. 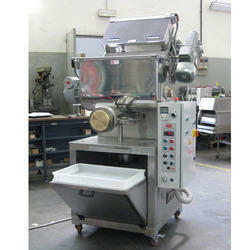 We are one of the leading names in the industry in offering a wide range of Pasta Machineto our valuable customer. The offered range of products is made from optimum quality component and under the assistance of highly skilled professionals. To maintain the world class quality, these products are tested on set industry parameters by the team of quality. We are offering these products at nominal market price within the committed period of time. We are offering a dynamic assortment of Pasta Making Line in the market, which is requires less maintenance and easy to use. Design and developed under the supervision of talented professionals, these offered collections are known for their durability. These products are highly appreciated by patrons not only for their easy usage and best performance, but also for a long service life. Our clients can avail these products at leading market price from us. Enriched with immense industrial knowledge, we are engaged in offering a technically updated variety of Pasta Extruder Machines that is highly demanded among the patrons for easy operations and high functionality. In their fabrication process world-class quality of raw components are used and these products are available with us in standard and also in modified forms. The offered products are quality proved in nature and are given as per the requirements of our valuable clients.